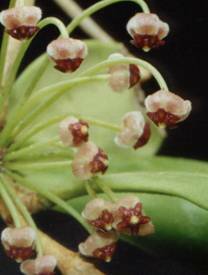 For several years the hoya pictured above has been widely distributed as Hoya incurvula Schltr. It appears that the collectors thought it that species when it was first found in Sulawesi (formerly the Celebes). A closer inspection proved that it was not that species. You may have obtained this plant labeled IPPS-8836, GPS-8836, IPPS-7718 or GPS-7718. 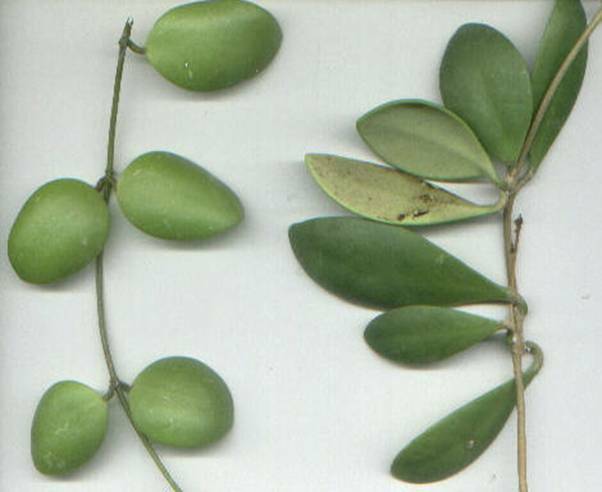 Left: Hoya brevialata. Right: Hoya incurvula. It has been the practice of certain collectors of hoyas to go out into the jungle at least once a year and bring back numerous cuttings of new species which they offer for sale to the public almost as soon as they arrive back home. Several people who accompanied some of these growers have told me that they make immediate identification of non-blooming plants, right there in the forest. All too often, the result is that the plants go out with the wrong labels. It is sometimes several years before the cuttings bloom, causing someone to question the identity. In the above case, it only took about three years but this error is much worse than those of the past because Hoya brevialata is being mass produced by large commercial growers who are labeling it Hoya incurvula. Reply: I don’t know where you can find a start of it but it should start showing up on dealer lists very soon. It is most likely that it will be listed as Hoya buotii but that is not its correct name. Hoya halconensis Schltr. ex. Kloppenb. The correct name for this species is Hoya halconensis Schltr. ex. Kloppenb. Mr. Kloppenburg published both names. It is easy to see why he didn’t recognize the living plant when he saw it as he’d only seen the Hoya halconensis type specimen for a few seconds and essentially published a description based on a Xerox picture of the 90-some-odd year old dried specimen which contained only three leaves (one of them with a broken apex) and an umbel with 6 flowers. There is little one can tell from a Xerox picture of a dried herbarium specimen. Doesn’t even show if leaves are pubescent or glabrous. I had that specimen here on loan for several months which gave me ample opportunity to examine the flowers and to run my fingers over the leaves to feel for hairs. I also put both leaves and flowers under the lens of my microscope and made copious notes about what I saw there. The biggest error Mr. Kloppenburg made in describing Hoya halconensis was in his description of the sepals, which he said were “hirsutis extis (sic).” That, I believe, means, “covered with stiff bristly hairs outside.” Mr. Kloppenburg’s spelling makes accurate translations rather “ify.” I have seen those sepals and Schlechter left a sketch of them. The sepals are ciliate but the outsides are covered with little pimple-like elevations, not hairs. Schlechter’s sketch of the sepal was almost hidden in the Xerox copy I made for Mr. Kloppenburg, due to a shadow cast by a mature plant stalk that partially covered it. I was able to lift that stalk and get a good look and could see the little round circles representing pimples. And, of course, I was also able to see them on the actual flowers. Another significant error in Mr. Kloppenburg’s Hoya halconensis publication was the statement that the corona lobes are “obovate and somewhat obtuse at their outer tips.” Hoya corona lobes that are described as “obovate” are those that have narrow inner angles with broadly rounded outer angles. Hoya halconensis corona lobes are not obovate. Schlechter’s sketches showed some pubescence on the flowers but not nearly as much as can be seen on the flowers in this picture of a living plant. 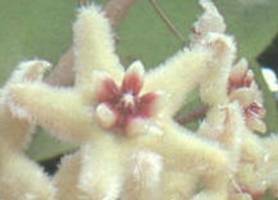 I found quite a lot of hairs on the flowers of the Hoya halconensis type specimen but still not as many as I see in the picture of a living plant. I can even see some hairs on the Xerox picture I made of the specimen before I returned it to Berlin. I have been assured by taxonomists that the difference in the amount of pubescence on the type specimen and on this living plant is insignificant and falls well within the parameters of this species. I passed this one by David Liddle who agreed with me that this is a fit. So, if you have a hoya labeled Hoya buotii, please change the label. It is Hoya halconensis. If you have one labeled Hoya boutii, that’s just Hoya buotii misspelled. Both are Hoya halconensis. In addition to this yellow flowered one, there appears to be one with orchid coloured flowers. Schlechter’s type (BS-5674) was collected by E. D. Merrill on Mt. Halcon on the island of Mindoro. The type citation for the name Hoya buotii is rather confusing, which makes me wonder about the validity of the publication. He cited “Type #67049 (CAHUP) but did not mention the collector’s name. He said that the type material was collected from Mt. Banahaw,* Quezon Province, Luzon, Philippines. Then he added that “the material is from the UPLB plant breeding program.” This leaves the impression that his type might be a hybrid or a seedling of something collected in the wild. * I’m not sure of the spelling. I could not find this on a map but every other place I’ve seen the name written previously, it has been spelled Mt. Banahow. Letter 2: I have just been given a cutting of a Hoya nova. Could you tell me something about it? What kind of flowers does it have and what is its native habitat? --- Scores of writers! Reply: There is no such species. The word nova is Latin. It means “new.” Hoya sellers like to show off their superior knowledge so that their customers will think they’re smart so they spit out a Latin word now and then. Funny thing is that it seems to have the desired effect. Every time they see a hoya they haven’t seen before, they jump to the conclusion that this is a “new” hoya, even though it may have been circulating in trade for years (even centuries). Very often it is something new to trade but just as often it is just something that is new only to the dealer. An unidentified Dischidia sp. from Hong Kong. (The Dischidia was also sold labeled D. milnei but it isn’t that either). Getting a correctly labeled hoya is about as difficult as getting that Biblical camel through the eye of a needle. So when you see Hoya nova or Hoya sp. nova just remember that if you buy it, you’ll be buying a “Pig in a Poke.” All it means is that the seller doesn’t know what it is. It’s just something he/she never saw before. It may be something you’ve had for twenty years. Rewriting the original hoya name publication to make the plant one wants to sell fit the name a seller wants you to think he has appears to be a full time occupation for some people. Here is just one example found in Volume 16 #2 (Apr.-June 2003) Fraterna. On page 14 in a column called “Photo Gallery Descriptions” there is a rewriting of Guillaumin’s publication of Hoya neoebudica. The paragraph describes a picture on the page opposite to it. The flowers are a lovely shade of pale pink. Both corolla and corona appear to be glabrous and shiny. No foliage is visible. Neither author nor photographer was credited (or apparently willing to take the blame). This is very obviously not the same species shown in Mr. Kloppenburg’s World of Hoyas as this species. This is not the same species I photographed in Mr. Kloppenburg’s own greenhouse in 1987 nor is the one sent to me by J. Donker of the Netherlands in 1983. All appear to be different species. Here is how the Fraterna author rewrote Guillaumin’s original name publication. He/she said, “The type description says that the corolla segments are lanceolate, apex acute.” That is, of course, not true. Here is how Guillaumin described the corolla: “Corolla 8 mm. diameter, lobes divided to middle, triangular implicate (folded or twisted).” No mention was made of the apex. This Fraterna “scholar” added, “The flowers are listed as yellow.” Actually, all other hoyas I’ve seen pictured with the label of Hoya neoebudica have been yellow but Guillaumin never mentioned any colour in his publication of the name Hoya neoebudica. As bad as those mistakes are, by far the worst false statement written in that piece by this unidentified author was the statement saying that this species was first described in the Linnean Society Journal (a British publication). That is utter rot! 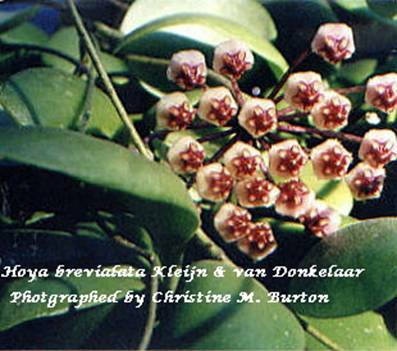 Hoya neoebudica was published by Guillaumin in The Bulletin du Museum National d’Historie Naturelle (a French publication). So you see, dear friends, the secret to being a successful seller of hoyas and becoming the hoya guru to the uninformed is to rewrite original descriptions to fit what you want your customers to think you are selling them!!!!!! Making up a new name for the publication where the name was first published almost guarantees that you’ll never be exposed as a liar unless someone you love to hate (like me) exposes you as the fraud you are! Don’t take my word for this. If you’d like a Xerox copy of Guillaumin’s publication of the name Hoya neoebudica and you can’t find it at your library, send me 50 cents and a stamped, addressed envelope and I’ll make a copy and send it to you so that you can see for yourself.